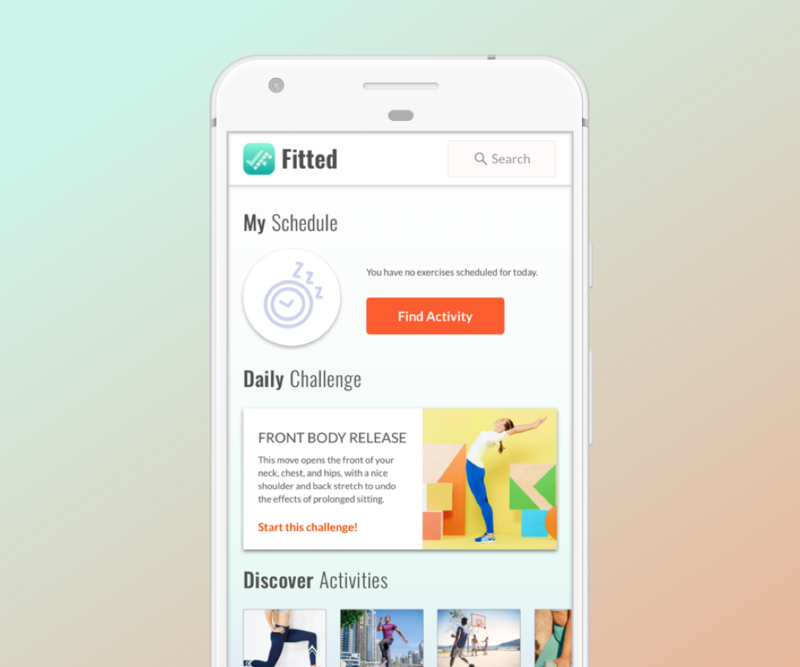 A motivational fitness tool that helps people find an exercise routine that suits their level, schedule, and interests. It's difficult to find a way to fit exercise into our busy lives. 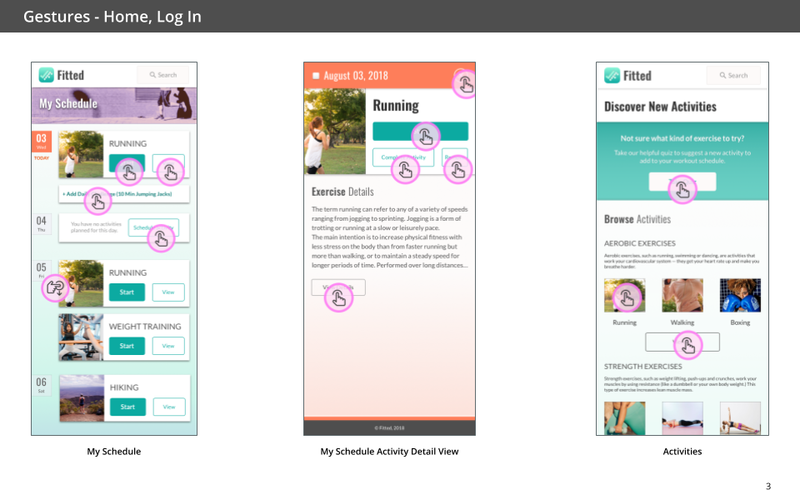 I designed an experience that allows users to locate and schedule a variety of easy and beneficial exercises. 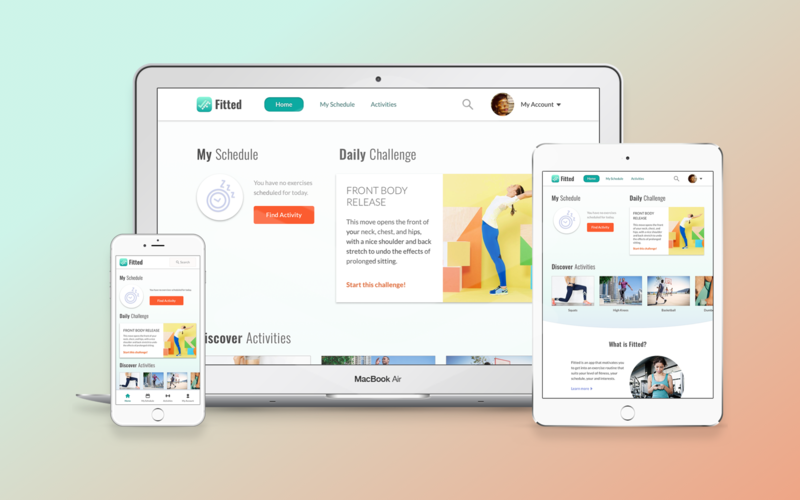 Users can browse a curated exercise list, learn about different exercises, take a simple quiz that will suggest exercise to try, add activities to their calendar, and see what kind of activities their friends have tried. reward users by providing silly but addictive badges that encourage them to keep working out while collecting rewards. 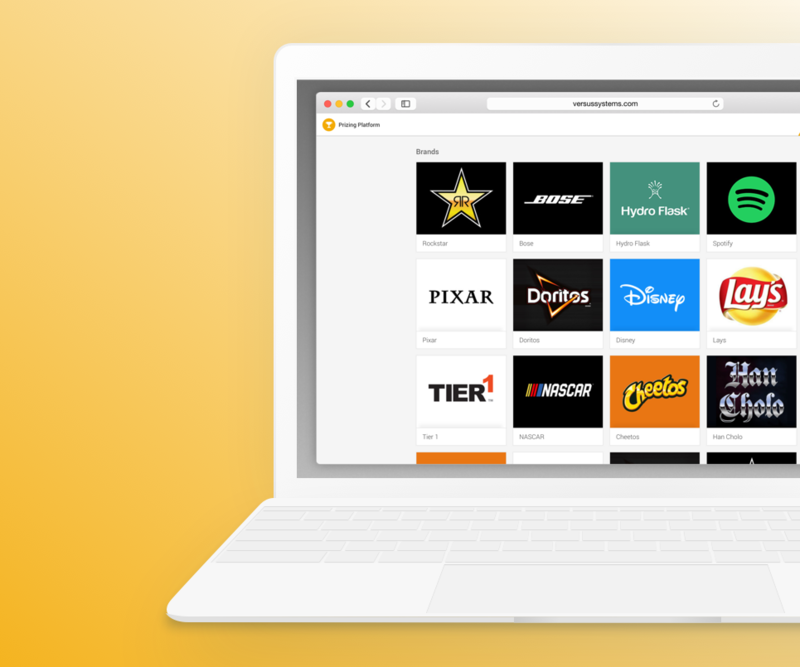 Additionally, I also feel the app would do well with official partnerships where people with a certain badge level could get rewards (like a discount on workout gear or healthy foods), but this may also be out of scope. As a new user, I want to learn about different exercises, so that I can figure out what is best for me. As a new user, I want to be shown how the exercises are done, so that I know I’m doing them correctly. As a frequent user, I want to be able to schedule exercises for working out, so that I build positive habits. As a frequent user, I want to be able to earn achievements or rewards, so that I can stay motivated. As a frequent user, I want to complete daily challenges, so that I can have an additional way to stay motivated. As a frequent user, I want to track progression and record what I’ve done, so that I can see my progress over time. 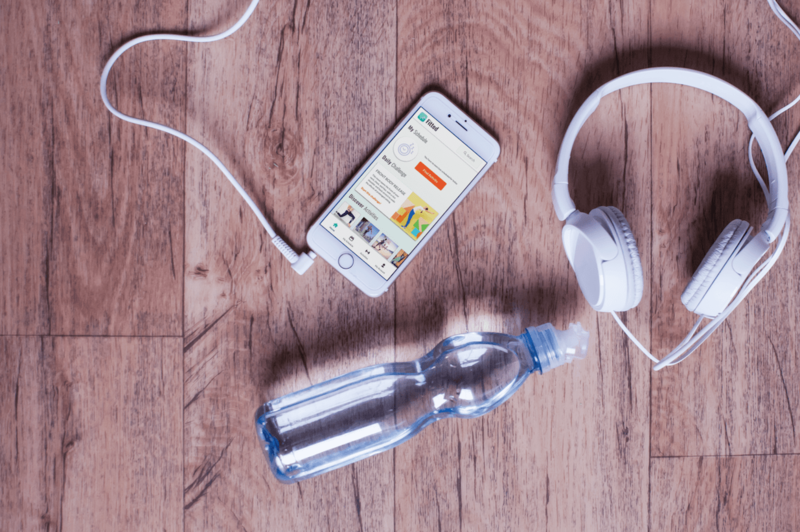 As a frequent user, I want to be able to share routines with my friends who may also be interested, so that I can encourage them to become healthier. I drew the wireframes for the key screens on paper and assembled a lo-fi prototype, available here (Invision). For Mood Board 1, I was inspired by fitness brands like Nike or Adidas. 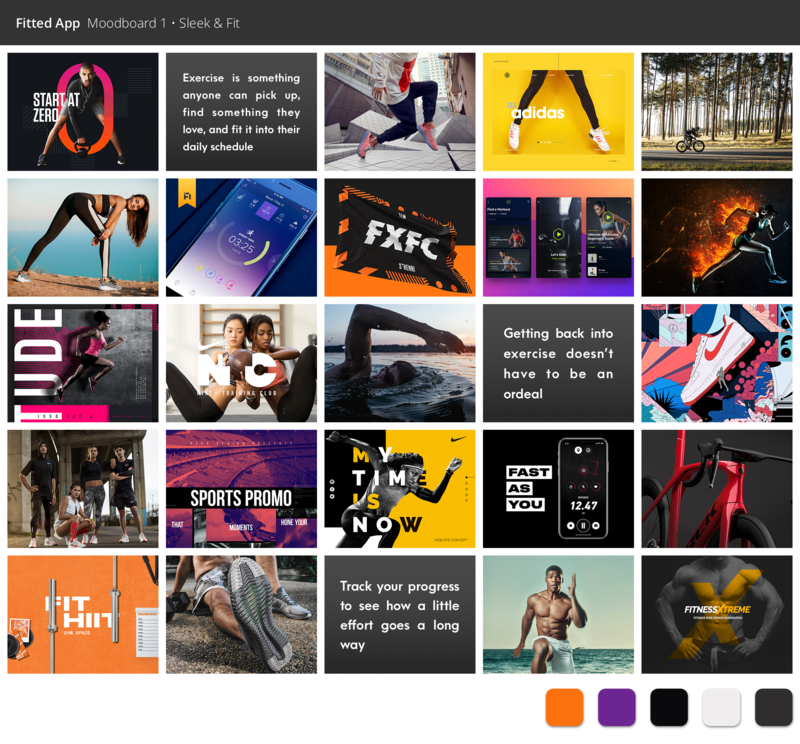 While dark colours and bold accents are often seen in fitness advertising, according to the design brief this app is supposed to appeal to people who want to exercise but don’t know where to begin. Seeing a lot of strong imagery with people who are already in great shape is likely going to be off-putting to a user who is just getting started. Fitted’s purpose is to provide an experience that motivates people into an exercise routine that suits their level, schedule, and interests. 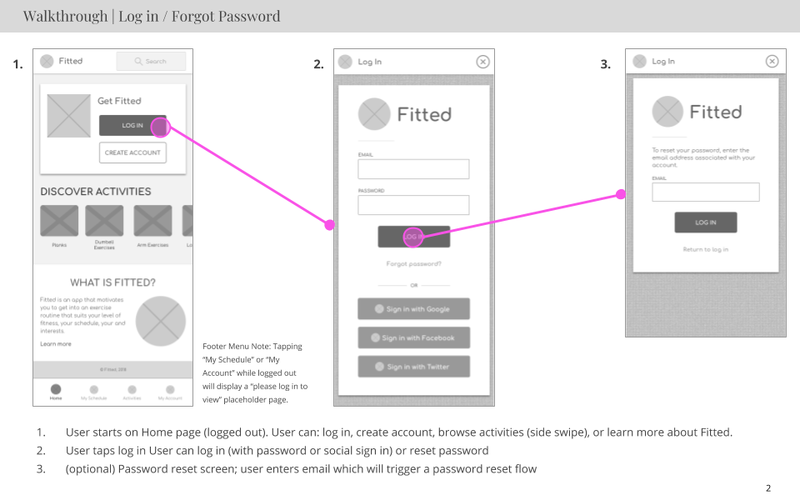 To learn more about the branding choices, view the branding section of Fitted's Design System. I chose Lato for the body text and Oswald for the headers. 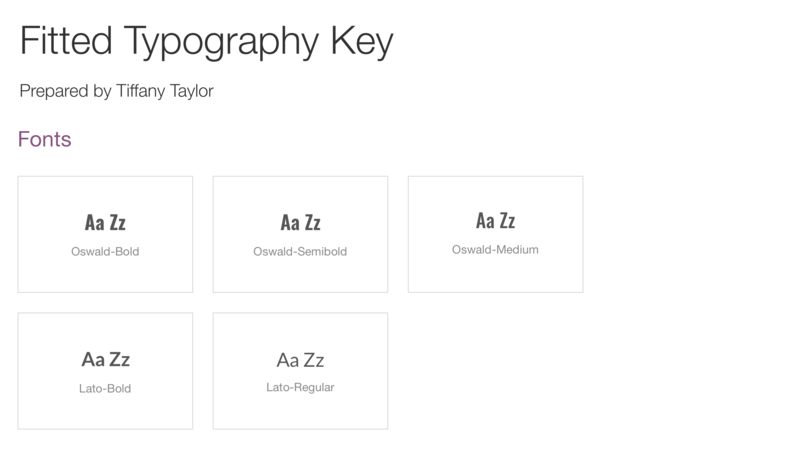 I felt Lato was a warm and easy-to-read app, and Oswald added a nice boldness that was not overwhelming. 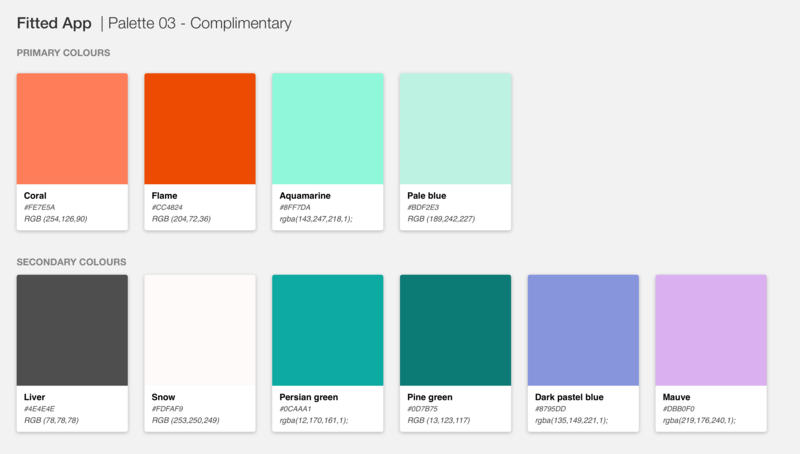 For the colour palette, I relied on my mood board and the project brief. I went with a complementary colour scheme with orange (coral) as the focus colour; the branding guide said to include “orange and black” but because this app is targeting beginners, I felt black was too heavy to be used as the focus colour. The palette has 4 primary colours. The complimentary Coral and Pale Blue, which a darker tone for each of the two hues. The secondary colours are for text, accents, and background use mainly, as well as for tinting or shading the primary colours as needed. 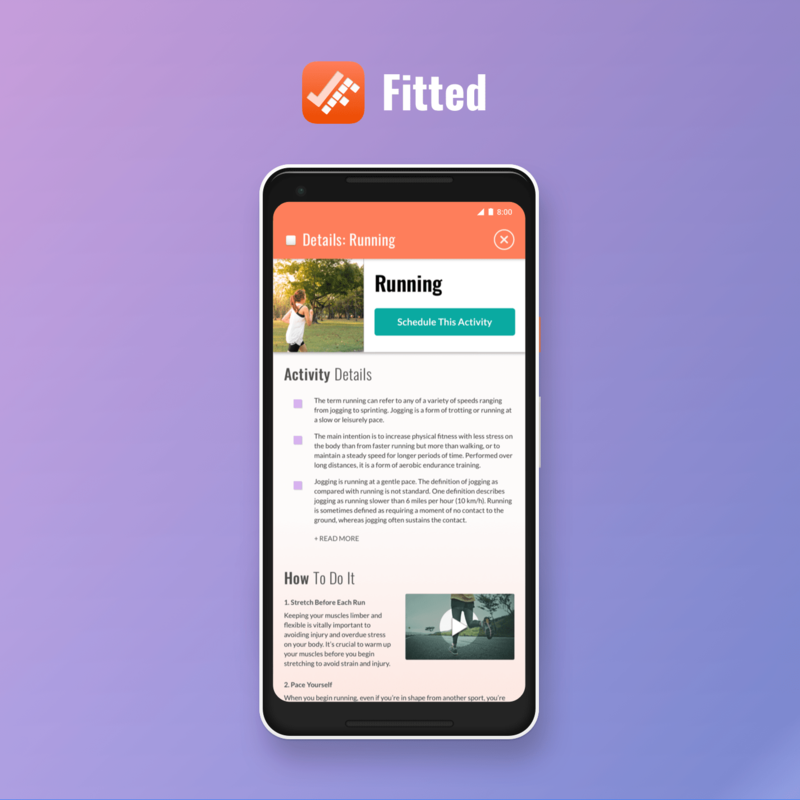 For the imagery in the app, the emotions and feelings I wanted to convey is that it’s still possible to set attainable fitness goals, even if you’re a newbie or unsure. Fitted is here to help anyone struggling with that scenario. These images I would select for my app should show natural looking people in everyday fitness situations. 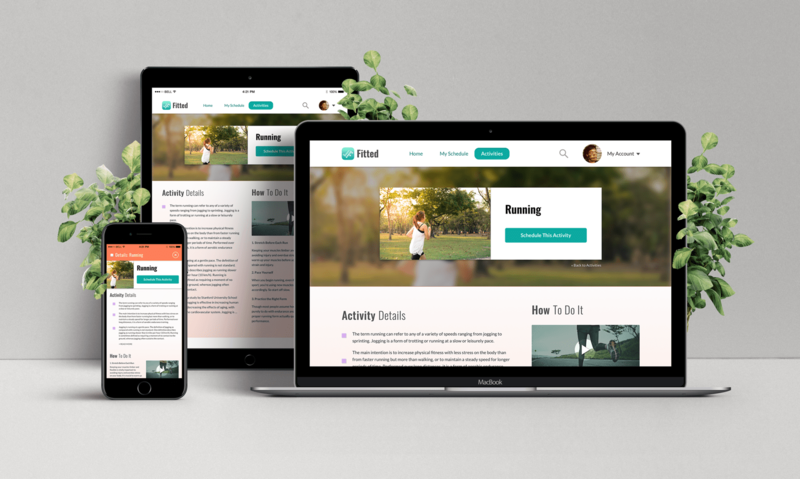 Scenes of people jogging, a gym atmosphere, playing basketball, exercising with friends, and getting fit in local parks are all relatable scenes that convey how easy it can be to work out in a variety of methods. I also created the icons at this stage. My inspiration for the icon was to use the letter F and incorporate a checkmark. I wanted a checkmark so I could convey the feeling of checking something like exercise off from your daily to-do list. Once the visual foundation was set, I started creating the high fidelity mocks to put in a hi-fidelity prototype. 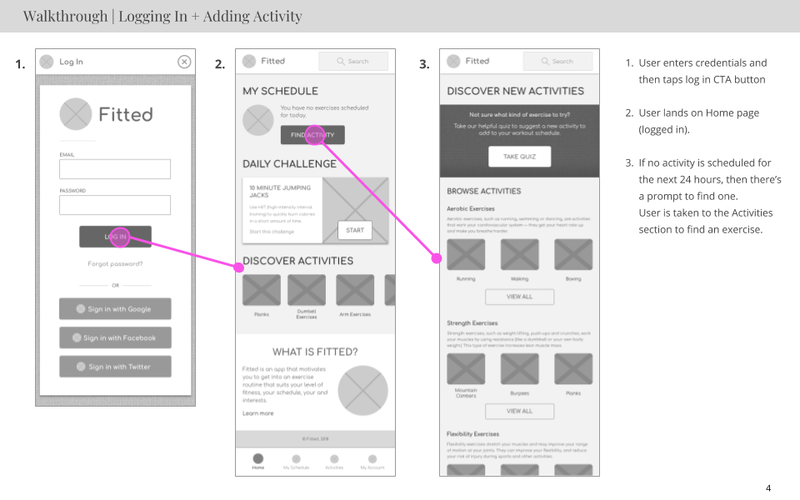 For this step, I had to consider the gestures a mobile user may use while interacting with the app. 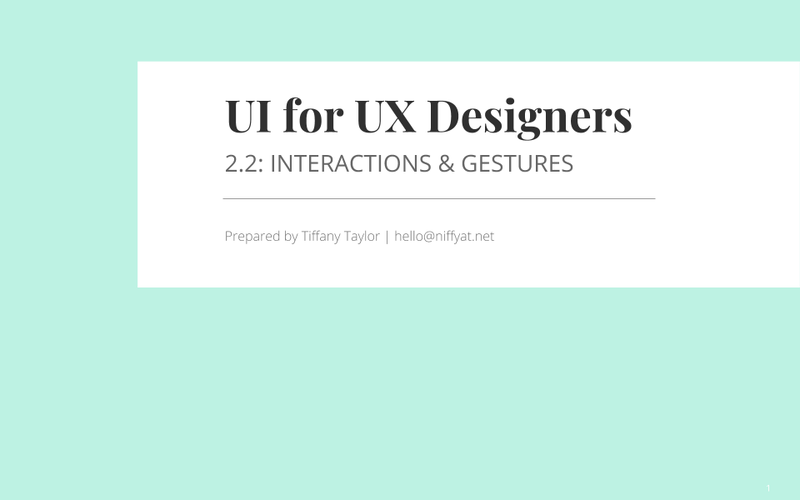 I created a document to explain how the gestures and other interaction patterns would work. Next, I designed a loading screen. It was my first time working in AfterEffects. I studied animation for a time in college so I was happy to put some of that training to use. Although a loading screen is not something we want users to view for a long period, I wanted to make a simple screen that displayed the Fitted branding. 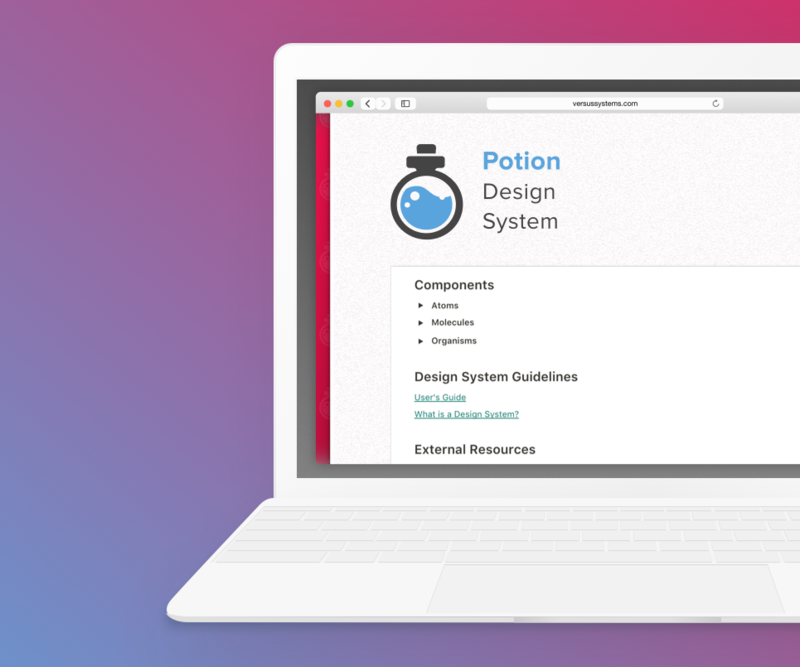 The next task was creating a design system. 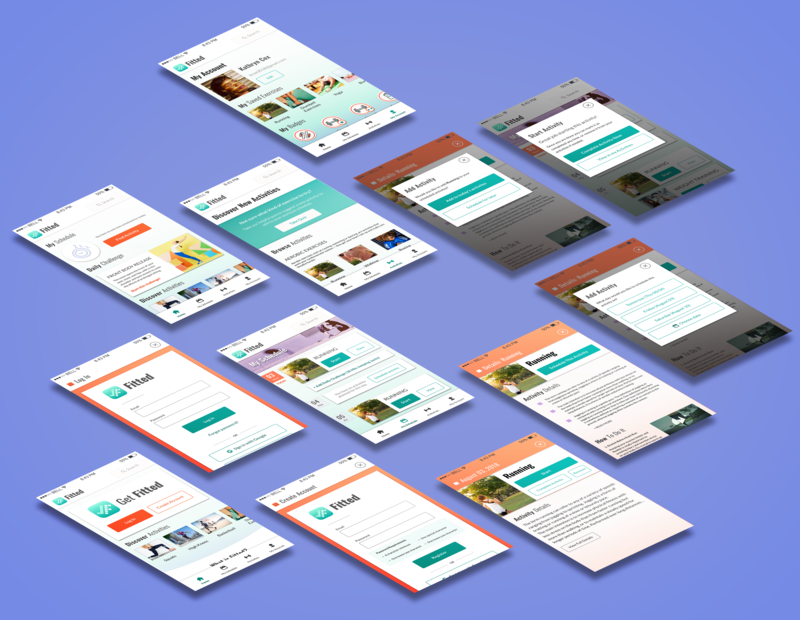 The design system will allow Fitted to have a consistent and concise voice across all platforms and screens. 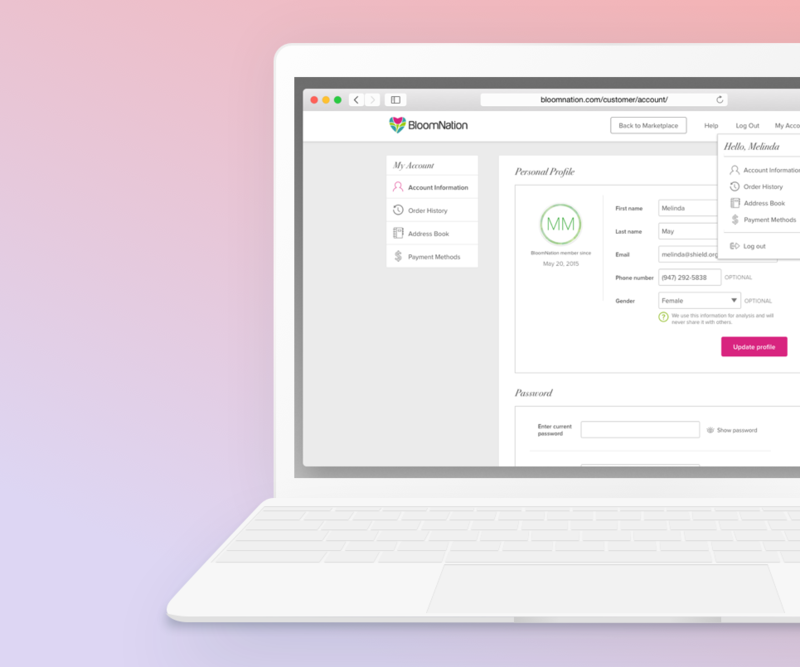 The last part of the course was to assemble the hi-fidelity prototype in Invision. 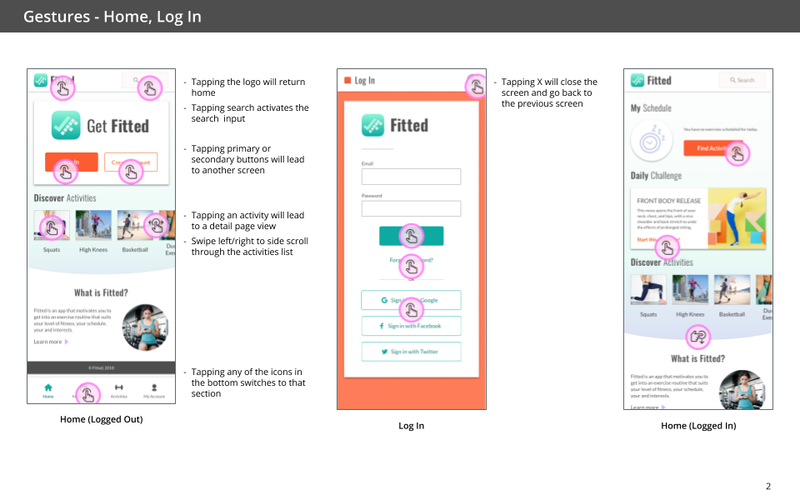 This project was completed for a UI design course that lasted about 8 weeks. It was a good experience because I have wanted to learn more about UI design and improve my skills in this area. I learned a lot from the lesson lessons and my course mentor, Matteo. Over the duration of the project, I had a few thoughts about things I wish I could have done differently or things I'd like to change in the future. Lack of scheduling, gamification, and social experiences. 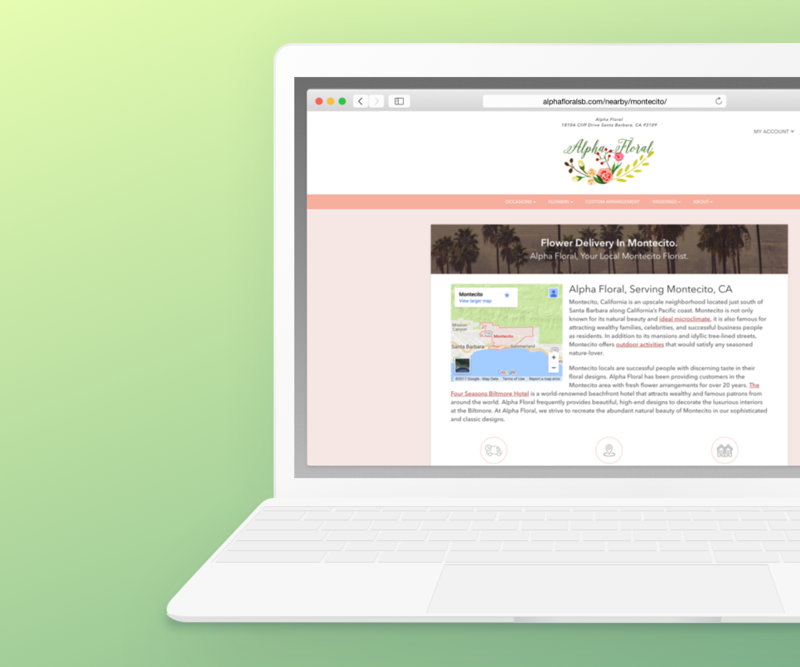 Due to time constraints, I didn't get to fully design these experiences. 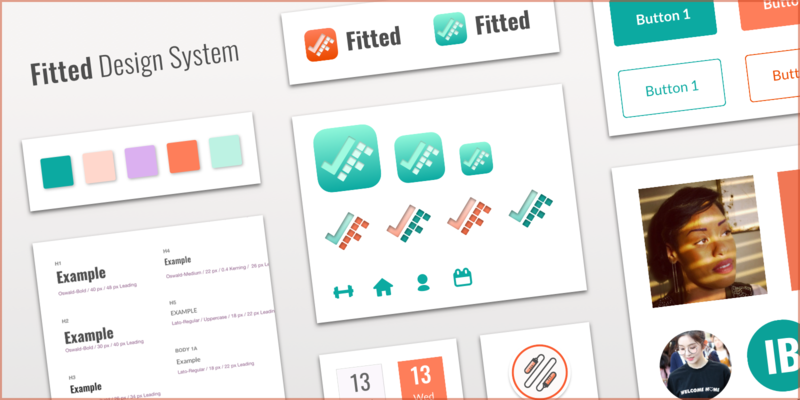 Fitted is meant to integrate into people's lives to make it easier to exercise. I really would like to explore how Fitted can integrate with popular calendar apps to automatically populate activities into a user's preferred calendar (similar to how Google Calendar does it). On the user profile, you can see there are badges but there are no screens for how badging works. The social aspect is seen on the activity detail screen with the "friends who tried" section, but there's no explanation of what happens when a user taps or clicks to view a friend's profile. 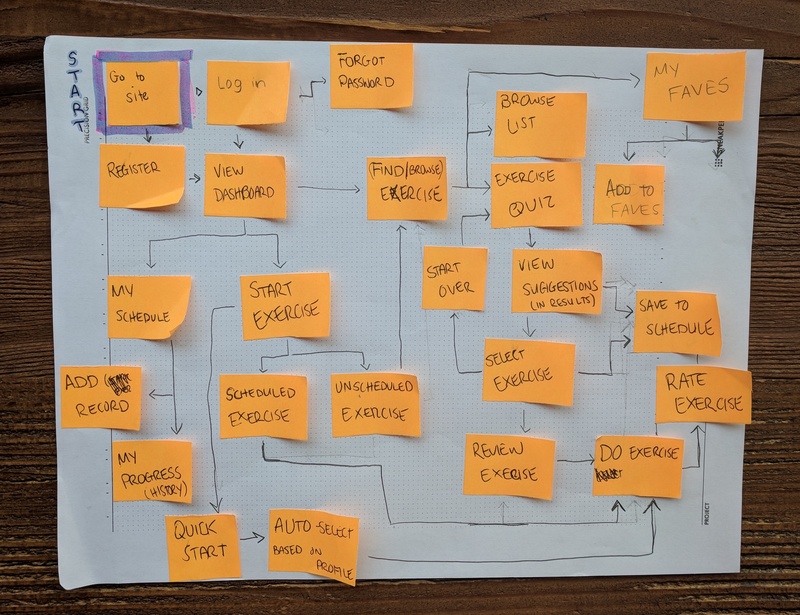 Gamification and a social integration would both allow Fitted to be a very motivational tool by encouraging users to stick with their routines. Limited user testing. 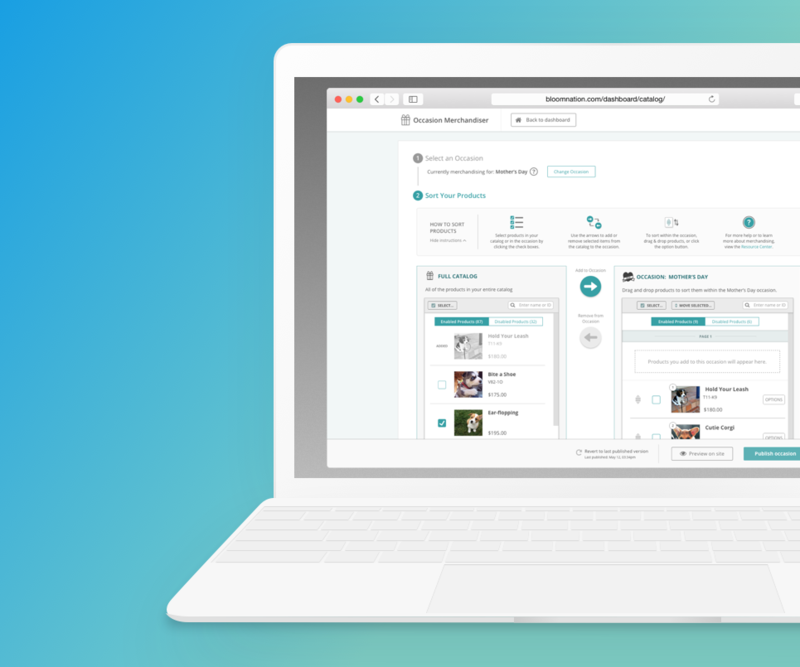 I quickly tested the lo-fidelity wireframes and imagery, but I did not get to test the more refined designs. 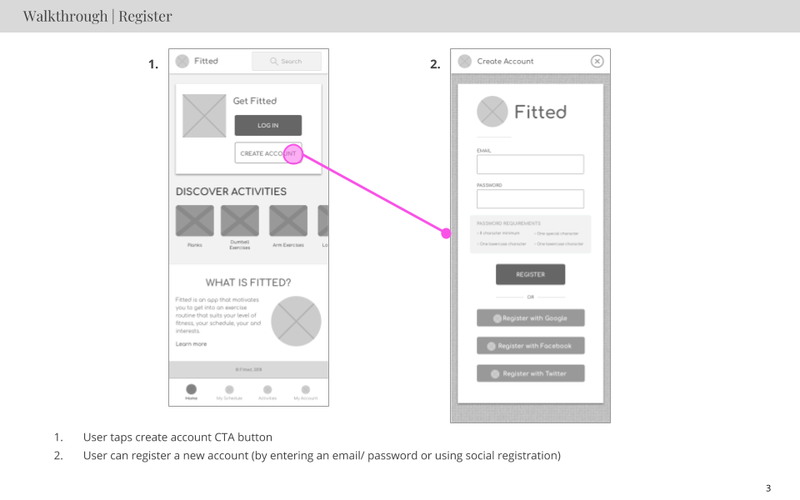 Without proper user testing, it's hard to tell how well users can achieve the tasks they want to do while using Fitted. App Colour Palette Concerns. I worried that the app felt very feminine. 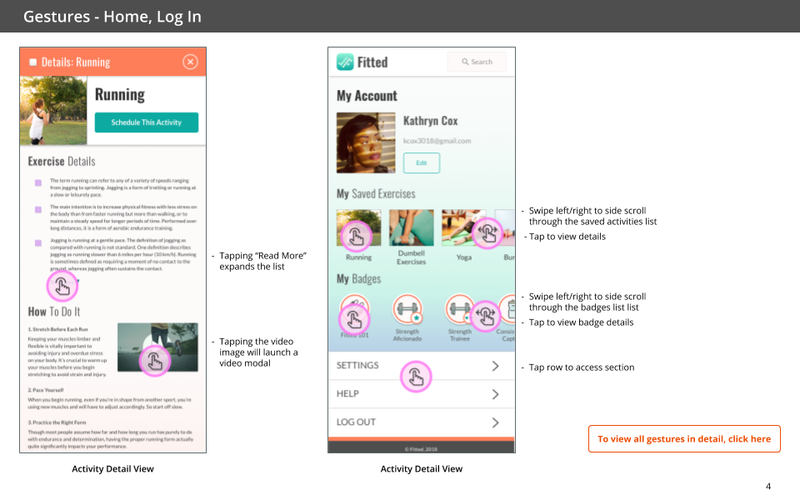 In the project brief, the user we were targeting was a woman, but I would like to test the app's design to see if it appeals to men and non-binary people as well. 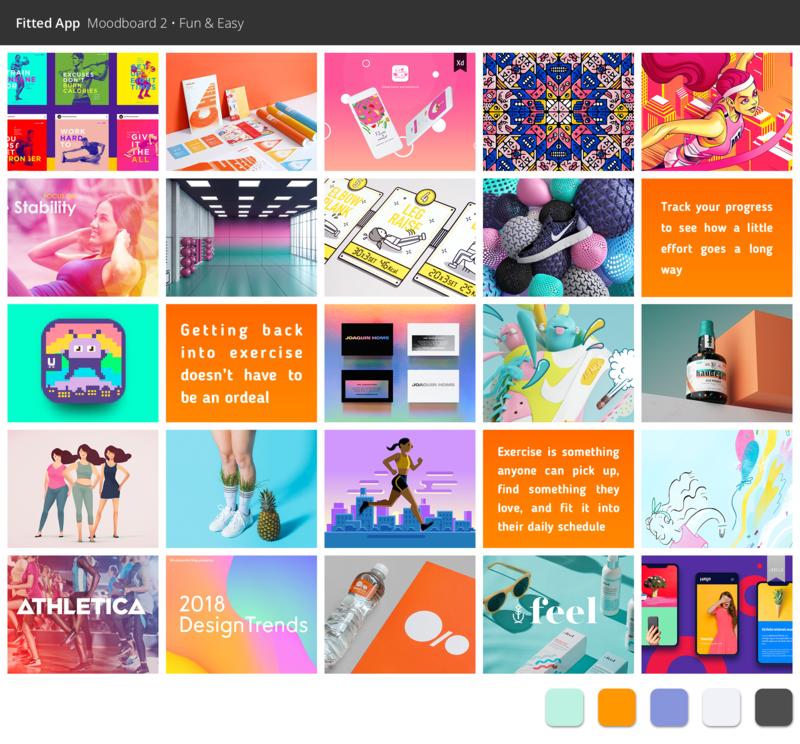 It's a lifestyle and health/fitness app, but the goal is to be inclusive so I would like to explore the colour and imagery choices to see how well that goal is being achieved.